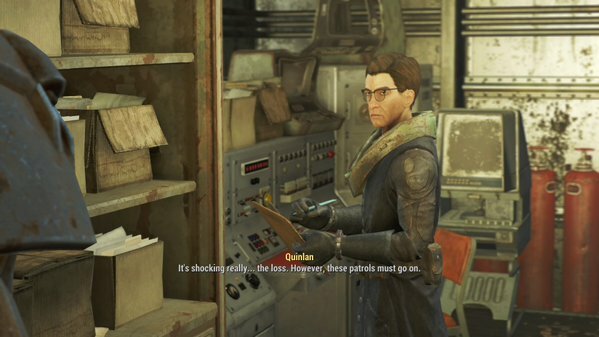 You’ll receive this quest after finishing up your initial tour of the Prydwen, which includes speaking to Proctor Quinlan for the first time. Once you’ve spoken to each of the heads of the Brotherhood of Steel, return to Quinlan and ask him about assisting in a patrol to trigger the quest. Wear Power Armor. In my experience enemies are more likely to attack people in Power Armor first, if only because you’re a louder, more visible target. You'll probably do this anyway, but try to fast travel to the closest possible location to your target as possible. Unlike most NPCs, Scribes are fully vulnerable to damage and will die if hurt too many times. Minimize the amount of exposure to danger. Try to fight in doorways. This will prevent enemies from flanking you and shooting at the Scribe. Don’t rely on the Scribe for firepower. Scribes will fight back if attacked, and are okay at taking down weaker enemies, but they can’t take much damage. You should ideally be dishing out the majority of the pain. If you're struggling to do damage, bring a companion. They can also act as a sponge, taking some of the attention away from the Scribe.